Cottage Sonoma @ Historic Plaza. FREE Winery Tasting Passports for all adults! 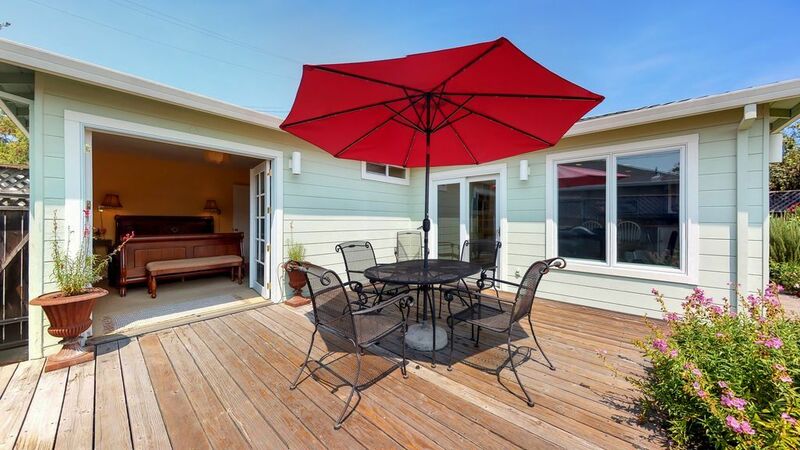 2 bedroom, 2 bathroom, private home at Sonoma's Historic Plaza. The House. We call it a Cottage but it’s really a full house, with two bedrooms, two baths, gourmet kitchen, private garden and hot tub. It’s a great place to share with friends, family, or just that someone special! The Location. Sonoma’s historic Town Square is the heart of the California Wine Country and it’s all just around the corner from Cottage Sonoma. Walk to wineries and wine tasting, historic sites, and fabulous restaurants. SPECIAL: All adult guests at our vacation rentals will receive a complimentary Sonoma Valley Wineries Passport providing access to free wine tasting at 20 Sonoma Valley Wineries (some exclusions apply). Many wineries charge $15-$20 per person for wine tasting, so savings add-up quickly. We love Sonoma! We fell in love and got married there, and our son was born there, but careers pulled us away - now we enjoy Sonoma vicariously through all the wonderful comments written by Visitors in our Guest Book! Sonoma's historic town square is the heart of the California Wine Country, in terms of both history and geography. Free Sonoma Valley Wineries Passport for each adult guest, valid for the duration of your stay! There were 6 of us in Sonoma for a family vacation. 3 stayed at the Cottage and loved it. The kitchen was so well equipped and all the amenities really worked! We could not have been more pleased. Exceeded our expectations and perfect choice for a getaway with dear friends. The cottage was charming, excellent location to the square with many special touches. Look no further— book this now for your vacation to wine country. Loved the cottage and proximity to the square! We loved this home. It was spacious, clean, and an amazing location to walk to the square. The home was beautiful and the layout worked very well for us and my mom to have bathrooms attached to our bedrooms. The house had everything you will need during your stay (and more!). Will be back next time we come to Sonoma! This house was amazing and in great proximity to everything! We will definitely be back!